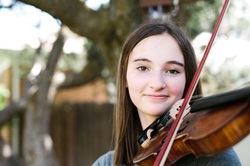 Caroline Maude Durham, 14, began studying the violin at age 4 with Doralee Madsen. She currently studies with Asheley Madsen Watabe. Caroline enjoys performing and has been featured twice as, a soloist on the Intermountain Suzuki String Institute Honors Recital. She was also selected to perform in the Utah Federation Honors Recital. For the past three years, Caroline has earned an honorable mention in the Utah Symphony Youth Guild recital auditions. Caroline served as concertmaster of the Wasatch Mountain Camarata and is currently principal second violin in the Young Artists Chamber Players. She is a full scholarship student at the Gifted Music School. As a member of the Ringtone Quartet, Caroline has studied chamber music with the Fry Street Quartet and Micah Fleming, and has performed at the Intermountain Suzuki String Institute. Caroline has participated in several performing groups, including Sotto Voce and Rocky Mountain Strings. As a member of the Rocky Mountain Strings, Caroline performed across Russia and the Baltic States. Caroline has performed in master classes with Jerry Elias, Linda Fiore and was selected for a special master class with Baiba Skride, sponsored by the Utah Symphony. Caroline enjoys sharing her music with others in the community. She regularly plays at funerals, church services, and care facilities. Caroline currently attends Wasatch Junior High. When not playing the violin, Caroline enjoys playing on the Wasatch basketball team, writing and playing tennis.